We are engaged in Sale-purchase of bikes. Our clients are ready to purchase both new and second hand bikes. Our second hand bikes are provided to our clients, who visit our country and prefer to have own bike, to visit places. 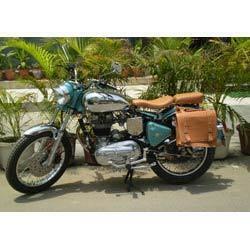 Renting of enfield bullets from last 15 years renting of enfields bullets all over india for individuals & groups - 350cc & 500cc Modification of bikes sale & purchase of bikes export of bikes from last 10 ye Mukash motors was established in 1986 & started its business of enfields bullets in 1992. We have many satisfied customers in europe & other countries of the world.